Secrets of our political past: where did prime ministers choose to call home? Number 10 Downing Street might be the official home of the prime minister but, throughout history, each PM has had other properties to retreat to. Many have chosen central London, close to the action, for a place to call home. Belgravia, Chelsea, Kensington and Westminster are favourites. As Winston Churchill, roars onto our cinema screens across the capital in the movie, the Darkest Hour, we celebrate 10 London addresses with strong links to our political past. Winston Churchill bought 28 Hyde Park Gate in September 1945. The house is in a perfect location close to the park. The following year, he snapped up the house next door, No 27 for £7,000, despite Clementine’s concerns that the purchase was extravagant. They combined the two back gardens and used No 27 for office space. After Winston’s retirement in 1955, they combined the two houses into one. The great man created a ground floor bedroom after a fall in 1962. In 2016, the property was put on the market for £23m. The average price of homes in Hyde Park Gate is currently £4.5m. 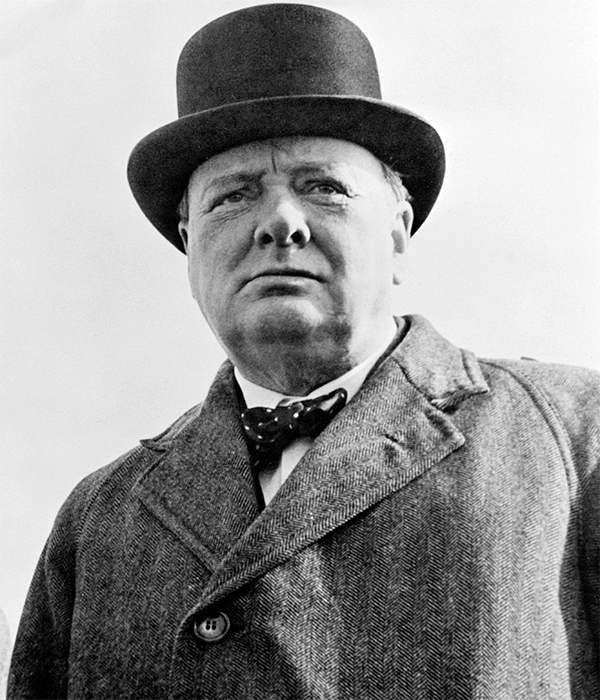 Winston Churchill once said that: “We shape our buildings; thereafter they shape us. His words still ring true today. This square was built by the Grosvenor family when they developed an area of marshy land across Belgravia and Pimlico in the 1820s. They built Belgrave Square and Eaton Square first, then started work on Chester Square. The stucco townhouses are listed, so they retain their 19th century grandeur and the uniform looks that makes this square so desirable. Former prime minister, Margaret Thatcher, lived here from 1991. Her house was put up for sale for £30m, while the average price on the square is more than £9m. This square was named after the Grosvenor family seat in Cheshire, Eaton Hall. Building started in 1827 but the final houses on the northeast side were not completed until 1853. The square is close to Buckingham Palace and is considered to be one of London’s top addresses. It has remained mostly residential, while many of the properties have been split into flats. Two prime ministers have made it their home – Neville Chamberlain lived at No 37 and Stanley Baldwin at 93. The current average value of properties on the square is nearly £5m. This is one of London’s most distinctive streets, dating from 1831 and lined with elegant stucco-faced buildings. Chesham Place is similar to wedding cake through and through with its elegant facades. Lord John Russell lived at No 37. He was prime minister twice, from 1846-52 and again from 1865-66. His government limited factory working hours and improved public health in towns, and Charles Dickens dedicated A Tale of Two Cities to him. The average price of property in Chesham Place is almost £7.5m. The most recent house sale boasted a price tag of more than £17m. Tony and Cherie Blair own both a main house facing onto the square and a mews house behind. Soon after they bought the mews, in 2004, the former first couple decided to connect the two. The chance to brush shoulders with the ex-prime minister in the communal gardens or at the corner shop adds a frisson of excitement. The average price on the square is now just over £4m. This is one of Mayfair’s virtually intact Georgian streets. The red brick houses are mainly five floors over basements, some with stucco fronting, behind smart iron railings. Anthony Eden lived here at No 6, a house once occupied by Beau Brummell. Eden served as prime minister from 1955 to 1957, and is best known for his part in the Suez Crisis. Eden’s house was sold in 2014 with an asking price of £8.5m, but the average price of property on this street is £4.5m. This is now a main road, but the mansions lining it are enormous and Henry Campbell Bannerman lived at No 6. He was prime minister from 1905 to 1908. A Glaswegian, he was an MP for 40 years before becoming prime minister. The white stucco house is grand with a porticoed entrance and it rises to six floors over a basement. Many of the mansions on Grosvenor Place are now in commercial use, but the occasional flat comes up for rent. You could expect to pay £900 to £1,500 a week here. Andrew Bonar Law is the only British prime minister to have been born outside the British Isles. He was born in New Brunswick, which later became part of Canada. In 1922, he became prime minister, but his main claim to fame is that he served for just 211 days. The houses in Onslow Gardens are attractive and ornate with classical porches and little balconies above. The average price of a property here is £3.5m. Sir Robert Peel was prime minister twice, in 1834-35 and 1841-46. He is probably more famous for creating the modern police force, which came to be known as bobbies or peelers after him. He died at the age of 62 when his horse fell on top of him, but he had lived at 16 Upper Grosvenor Street. This road runs east of Hyde Park, in the heart of Mayfair. Most of the large houses have been split up into flats, with an average price of £4m. Now a mix of residential and commercial property, Curzon Street has a long rich history. It was laid out in the 1720s near the original May Fair that gives the area its name. Oscar Wilde based some of his best-known characters in the street, while Roald Dahl’s Henry Sugar lived here, too, throwing money from his balcony into the road. No 19 was the home of Benjamin Disraeli. He was prime minister from 1874-80 and again for 10 months in 1868. He bought the lease of the house with the proceeds of his book, Endymion, in 1880. The average price of a flat in Curzon Street is £1.8m. Henry & James is one is one Belgravia and Chelsea’s premier estate agents for residential sales and lettings. Are you thinking about buying, selling or renting in 2018, get in touch with our team on Tel: 020 7235 8861, email: belgraviaoffice@henryandjames.co.uk or visit henryandjames.co.uk).